As laparoscopy in the abdomen, Video-Assisted Thoracic Surgery (VATS) has represented the revolution of the surgical approach to the lungs. Compared to open thoracotomy, VATS has demonstrated a significant reduction in pain, time for recovery, complications, and, not least, an improvement in the daily quality of life. 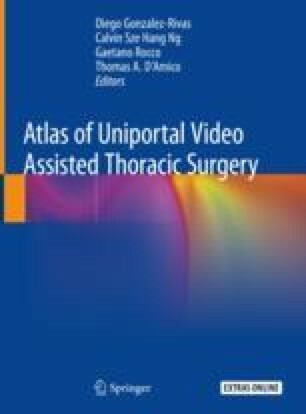 Uniportal VATS (UniVATS) may be seen as a further step of minimally invasive thoracic surgery, consisting in only one small incision allowing simultaneous introduction of instruments parallel to the thoracoscope through an ideal cylindrical space as vast as a surgeon’s finger-breadth without further dissection of the intercostal space. An enhanced hand-eye coordination to visualise and operate the thoracoscope-surgical instruments ensemble is required. In particular, the thoracoscope is handled to view the position of the instruments at any time during the procedure with simple zooming in or out. UniVATS geometric configuration of the approach is entirely different from the standard three-port VATS settings. The use of a single port favours a translational approach of VATS instruments along with a sagittal plane. The single port configuration enables the devices to move along two parallel lines on a plane approaching the target lesion from a craniocaudal perspective, and this allows to bring the effective fulcrum inside the chest in a way comparable to open surgery.